I sat down with three Gears of War veterans the other night. Each of us had played through the Gears of War, GoW 2 and GoW 3 campaigns. We joined up to run through the latest entry in Epic's gutsy franchise, Gears of War: Judgment. We were playing combo co-op, two players on one couch in SoCal, two players splitscreening in San Francisco. Lancers lanced, gnashers gnashed, boomers boomed. You get the idea. The gears of war were once more set in motion. We took cover, threw grenades, and chainsawed Locusts with ease. The connection was solid, the game felt familiar -but something was off. After about an hour we decided we just wanted to do something else. That is not a good sign. As its core, Gears of War: Judgement is fine. It has the exact same cover-based third-person shooter mechanics as GoW 3. There are four new weapons -personally, I love the Breechshot- but not much else has changed. This is one of the Xbox 360's flagship franchises. We should want to play through the campaign in one sitting, but we were ready to tap out halfway through the second chapter. What the hell was going on? Simple. The campaign in GoW: Judgment is a campaign in name only. Yes, there's a story about Baird and Cole in the days following Emergence Day, but it's a story about Baird and Cole in the days following Emergence Day. We know what happens to them. Did this story really need to be told? Tossing in a few extra characters to round out the roster doesn't really add to the lore. Baird, Cole, faux-Russian dude, and girl. Or as I call them, not-Marcus and not-Dom. Most modern shooters do a good job of disguising the fact that the story mode is basically a simple MP bot match by adding things like badass set pieces, or having the action take the player through lavish environments or open areas. A well intertwined story facilitates the process. GoW: Judgment's campaign revels in being a simple courtyard shooter while tossing us tidbits of plot. The core gameplay of the Gears franchise is so good it still works, but just barely. 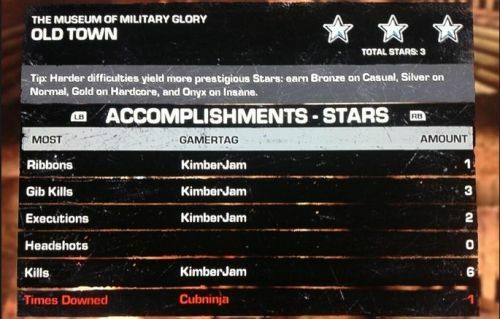 You can earn up to three stars in each skirmish. This one was bull$#!%. The Polish studio, People Can Fly, are the first studio credited at the end of GoW: Judgment. 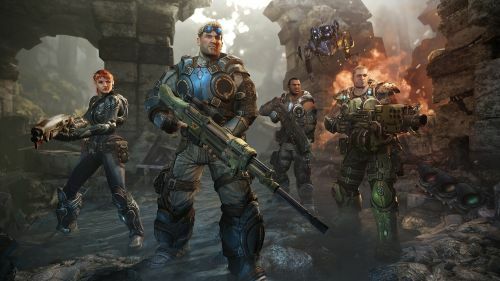 I had hoped their experience with the beautiful and deadly environments of Bulletstorm would translate well to the Gears franchise, perhaps offering a new glimpse of Sera in the early days of the Locust War. Nope. Just the same beat-up looking Sera we've come to expect from the previous games, only this time with more enclosed areas. Remember the Kryll from the first Gears of War? What about the razorhail, or the that giant worm in GoW 2? RAAM and Scourge? How about every single thing that wasn't a simple Locust firefight in the three previous titles? There's nothing like that in GoW: Judgment. The game is one simple arena shootout after another. It's just Baird, bairding up the place, while Cole Train says, "The Cole Train takes what he wants!" every time he picks something up. (Careful, Cole. That's the kind of attitude that gets pro athletes like you in trouble.) The main Locust badass makes a brief, forgettable appearance and then we don't see him again until the end of the game. Nothing's broken, but for a chapter in the Gears franchise, it's all just so disappointing.